The first hard drive with a capacity of 1TB is about to hit the shelves. Hitachi Global Storage Technologies (HGST) is aiming its Deskstar 7K1000 at consumers, but also has a 1TB CinemaStar model for set-top box manufacturers - especially for boxes that record HD. Hitachi says the Deskstar will debut at around the $399 mark in the US. It's available with both SATA (3.0Gb/s) and ATA interfaces. "The industry's first one-terabyte hard drive represents a milestone that is 50 years in the making, and it reasserts the hard drive's leadership as the highest-capacity, lowest-cost storage technology," said Head of Marketing Shinjiro Iwata. Hitachi has also released software designed to best manage hard drives used in set-top box situations - especially when constant access is required for applications such as IPTV or HD streaming. Called AVSM, or Audio-Visual Storage Manager, Hitachi's aim is to increase duty cycles by up to 50 percent. In 1956, the RAMAC, the first hard drive stored 5MB of data. That's almost equivalent to one 4-minute MP3 song. That same year, the RAMAC cost $50,000 or $10,000 per megabyte. 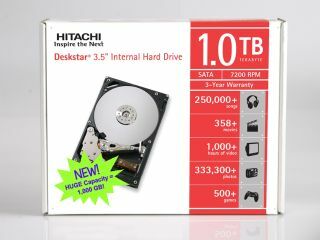 Hitach's one terabyte hard drive, a gigabyte of storage costs less than 20p. It took the industry 50 years to ship almost 3 billion hard drives; some analysts predict we will ship another 3 billion in just 5 years.